MARK YOUR CALENDARS: THE MARKET WILL BE CLOSED SATURDAY, NOVEMBER 24. It’s that time of year when eggs are starting to run low on the market. It’s not that the cold temperatures reduce laying; in fact, decreasing daylight does. Laying hens need between 14 to 16 hours of sunlight in order to be fully productive, so fall and winter are naturally a time of rest. Of course, they don’t stop completely, but you will notice a significant drop in available eggs. My Daily Bread makes holiday entertaining easy with their new cookie platters. Platters come in three different sizes to please any crowd you might have. Cultured Traditions is running a special on Pumpkin Spice Jun. This is a limited edition, so try it before it’s gone! Simply Southard has two new items for you to try, Pickled Jalapenos with Carrots and Onions, as well as Jalapeno Salsa. Find them in the “Processed Foods” category. Back in Time will be back any week now with more chicken! Doug’s Wild Alaskan Salmon is back on the market! He is stocked with halibut (12oz this time), salmon fillets and portions, and salmon burger. All seafood is MSC certified sustainable fish, all natural, nothing added. Doug’s Wild Salmon is owned and operated by the Resetarits family, three generations of fisherman who operate boats in Bristol Bay, Alaska. Doug will continue to supply our market until this year’s catch runs out. Ancient Awakenings is on the market this week with a new, seasonal flavor, Apple Cider Kombucha! Back in Time will be back soon with more chicken! This is your last chance to place an order for White Oak Pastures pastured meats. To place an order, email thecummingharvest@gmail.com ASAP or come by the market. 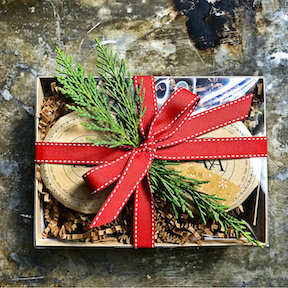 Southern Essentials makes several all-natural room sprays that smell like the holidays. You won’t be disappointed with Cinnamon and Orange or Pine and Spruce Room and Linen Spray. Doug’s Wild Alaskan Salmon is finally back on the market! He is stocked with halibut (12oz this time), salmon fillets and portions, and salmon burger. Fill your freezer while they last! Royal Rose Bakery will be gone for the month of November, so stock up on pot pies and quiches this week; it’s your last chance to get them until December! A&A Alta Cucina is on the market for their once a month listing. 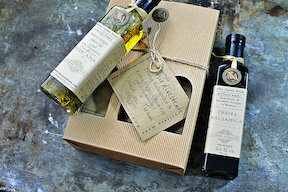 Look for their award-winning oils, vinegars, pestos, and tomato sauces, as well as holiday gift sets (in the “Gift Bags and Box Sets” category.) They make lovely gifts! Are you a baker? My Daily Bread has Red Organic Wheat milled to order. Look in the Grain and Milled Products category. Saturday, October 27 is your LAST CHANCE to pre-order your fresh, pastured Thanksgiving turkey from White Oak Pastures. Email Jennifer at email thecummingharvest@gmail.com to reserve yours today. The next White Oak Pastures Order is underway. Please have your orders to Jennifer by NOVEMBER 5. To place an order, email thecummingharvest@gmail.com or come by the market. The market is gearing up for fall! Ancient Awakenings has a new, seasonal flavor, Apple Cider Kombucha! Try one of My Daily Bread’s new creations, including Caramel Apple Bread and Cranberry Orange Spice Muffins. Royal Rose Bakery is back in time for cooler weather with your favorite pot pies and quiches. Look for Cultured Traditions’ new line of soups in the “Prepared Foods” section of the market. Southern Essentials’ Antibacterial Blend essential oil will help fight off bacteria and germs, and smells like cinnamon, too. In the BATH AND BEAUTY section of the market, you can find products from Southern Essentials and Buffalo Gal Grassfed Beauty— everything from essential oils to room sprays, deodorants to soap and face wash.
HI EVERYONE! I CAN’T EVEN EXPLAIN WHY THE EMAIL DID NOT SEND THIS MORNING! I HIT THE SEND BUTTON AND THOUGHT IT WENT THROUGH. HERE IT IS A BIT LATE! My Daily Bread has a few new products on the market this week, Sourdough Bread Dip Bowl and Sourdough Bread Soup Bowl. These bread bowls are the perfect vehicle for your favorite dips or soups, ready to go for game day, holiday parties, or just because! Have you tried Bramberi Farm and Gardens raspberries yet? If not, you are in for a treat! Don’t miss these while they are still available. Back in Time will be back in a few weeks with more chicken! The next White Oak Pastures Order is underway. Delivery will be delayed until early November to coincide with TURKEY delivery. Please have your orders to Jennifer by NOVEMBER 5. To place an order, email thecummingharvest@gmail.com or come by the market. If you are interested in ordering your Thanksgiving turkey from White Oak Pastures, please let Jennifer know by October 27. Turkeys come in three sizes, small (8-12 lbs) medium (12- 16 lbs), and large (16+). Pricing below does NOT include tax or shipping. There will be a special pickup day for turkeys on Thursday, November 15, as they will be fresh, not frozen.